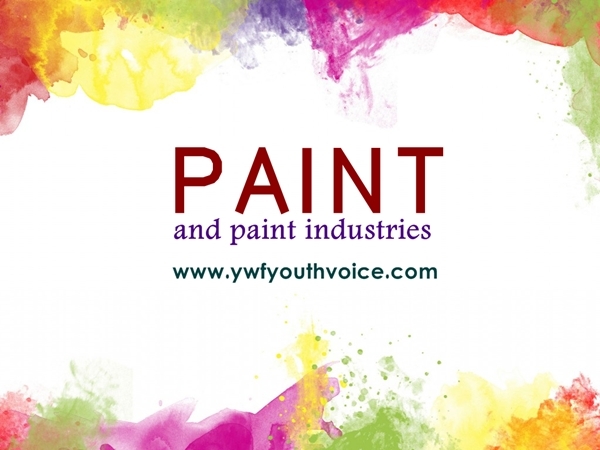 Basic introduction to paint and paint industries: definition, uses, constituents, classification, manufacturing etc. Paint can be defined as a coloured substance which is spread over a surface and dries to leave a thin decorative or protective coating. Paint is any liquid, liquefiable, or mastic composition that, after application to a substrate in a thin layer, converts to a solid film. Paints are stable mechanical mixtures of one or more pigments which impart desired colour and to protect the film from penetrating radiation, such U. V. rays. The pigments and the extenders are carried or suspended in drying oils called vehicle. Which is a film forming material, to which other ingredients are added in varying amount e .g. linseed oil, tung oil, castor oil, tall oil etc. Boiled Linseed oil is prefered to unboil oil because it develops a good drying power and requires only two days for drying. The drying time is reduced further by adding driers to the paint. Driers act to promote the process of film formation and hardening. Thinners maintain the uniformity of the film through a reduction in the viscosity of the blend. The purpose of paint may be protective or decorative or both and can be applied on a metal or wood surface. It is applied by brushing, dipping, spraying, or roller coating. Figure above shows simple block diagram for paint manufacturing in industries.